What’s what in a Mirror? Precisely how does an institution like a museum locate itself in relation to history? Where is the visitor located in the celebration of historical events? Combining the pressures of commemoration and the contingencies of the contemporary, internationally acclaimed artist Liam Gillick invites the visitor to his exhibition at The Hugh Lane into a space of self-examination and reflection on the function of a museum. Gillick changes the traditional display format of an exhibition and shows work at various locations within the Gallery. The artist provides audiences with a moment’s reverie for the production of self-reflection and appraisal of the now. He asks what the apparatuses are bringing the remnants of the past into the present and bringing things of the present into the future. How has Irish identity stretched since the vision of Mise Éire of 1916? Who is contemporary Ireland commemorating the Rising? A series of desks and stools constructed from lacquered wood, each furnished with a mirror, are fixed to walls within The Hugh Lane Gallery. The structures rely on the architecture and context of the museum to function. Visitors are encouraged to sit at the desks and work, read, check their phone or just look in the mirror – their backs turned to the art – either observing themselves, the art collection or fellow visitors behind them. The desks are offered as sites of self-reflection and aesthetic absorption for our visitors in this centenary year. 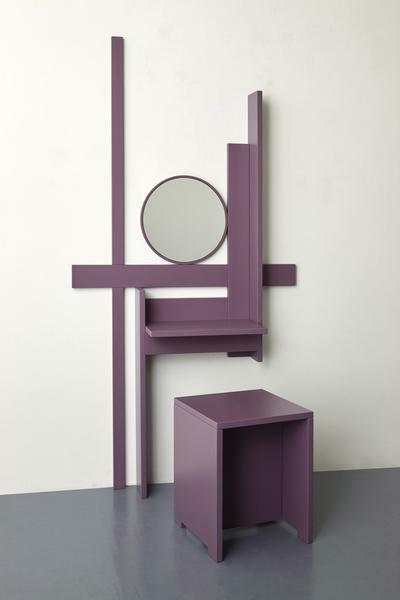 Appropriating the aesthetic context of 1916, they carry traces of the early modernism in their form, reminiscent of European avant-garde movements such as Russian constructivism, Bauhaus, and De Stijl. Accompanying the desks is a short book consisting of texts compiled by Gillick that contrast scientific papers on self-image and a traditional Japanese tale of vanity and hubris.